In a discussion that staff may not be seeing at http://hubpages.com/community/forum/142 … red-lines, several users have complained with good reason about changes in color that hurt the eyes and make it difficult for the color-blind to read. In fact, the changes hurt my own eyes and on the accounts page, I can't read the second top bar (gray) at all. Thanks. I notified the staff via email to move this to the other forum that's monitored by staff. But they never paid attention yet. These changes are terrible and staff is not responding to the complaints. I also find it strange that they didn't make any announcements about this yet. It makes it look like something strange is going on. I never saw an untested upgrade put into production without warning before. The orange lines under article titles have been removed. The color scheme was tested with a colorblindness plug-in before the change. If someone is having trouble viewing the stats page, please let us know specifically what the problem is. A link to the forum and the notifications (on the main menu) would help. It should be obvious that almost every writer who has posted about this change is having problems with it. I, personally, am finding it very hard to find my hubs because the titles are not printed straight across as before. I also have problems finding the forums. In the past, the changes the team has made have been helpful, but this one is a loser that makes working with our hubs awkward and difficult. I urge the team to go back to the old format. There is no reason for making this change, and it is highly ineffective. Matt, I sent a complete list of problems to the team email this morning. I'm having a problem viewing my stats page on my mobile phone. It only shows stats for 7 days and hub status. The one day view and the rest have been cut off. The old format is pretty okay. A "plug in" is not a person; nor can it accurately replicate human vision, whether fully functioning or limited in some way. Test such things with focus groups, not machines! The most important point is that it's impossible for the color blind to discern some of the colors. That needs to be addressed as that's quite a large chunk of the population. I just saw this latest change when I signed in tonight. I don't care for it. And certain things that used to be at the top of the page are now harder to find...like the link to forums...obviously, I found it, but it took some hunting. That should not be the case! It seems every time they make a change, and just when I finally get used to it, and comfortable using it, they go and change it up again! Grrr. As for the color blind issue, I agree--indeed; my husband is color blind, and some things like that give him trouble. I'm still "hunting" for the forums link. Though I read it is somewhere at the bottom of the page, I still can't find it. Even with the red (link) lines removed, I still don't like this new look. It's not at the bottom of the main page; you have to go to the three lines at the top left. That gives you a drop-down menu, and the Forums link is all the way at the bottom of that! Thanks, DzyMsLizzy. I will go back and search for it. I would never have thought.... and why is it way, way down? Took me a few seconds to realise I had to scroll down to the end. I reported that problem but Matt said "For now, it will remain in the same place." I guess they don't want the forum to be used much anymore (I'm not serious - but it sure looks that way). or you can click on the Earnings page and then click on forums. Yeah, but that will disappear soon when they upgrade all the pages with the new template. I don't understand. What do you mean "upgrade all of the pages with the new template". I'm having a hard enough time now trying to navigate and just hate that they're doing this! I looked there and saw nothing. I was looking at the three lines in the upper left corner of a hub. Are those the same ones you're referring to? If not, what is the "main page' you're referring to? Never mind. I found it. Why in the world would they place it there? I don't get any of this. Why make things difficult for writers. Makes no sense to me. I don't like it either. The stats page etc in the old design was a lot better. I dread the day they change the forum to these colours too. I said awhile back that the orange/teal is just - annoying. Even worse when you mouse over a link and it's orange ON teal. Yes, I do think the old look was outdated, but the new look as well as UI is just TOO far from the simplicity of the original. I loved how simple the old UI was and how easy on the eyes the old colours were. The new colours make me think of MFA (made for Adsense) sites that use specific colour combinations to annoy or play on emotions to encourage clicks. Fine, for the main hubs and categories. But can we please keep the member only areas (and possibly forums) less loud and more quick and easy for navigation? It seems to me that this was a very ill thought out plan that needs to be revised asap. Isn't it also curious that the stat update hours/minutes is now gone? Not sure if that's good or bad. I used it a lot to gauge when to come back and check my stats. It never seemed to update regularly, though. But I do think that it would be worth upgrading its accuracy and returning it to the stats page. To upgrade the accuracy of the stats would require HubPages to assign a programmer to the task. As you know, HubPages runs a tight ship and can't afford to have staff working on low-priority tasks. So I can see why they decided against fixing the stats counter. The thing is - as you know, deep down - writing on HubPages is a long-term project. Frequently checking your stats does absolutely nothing to improve your traffic or income, so it's not a core requirement. If you're thinking about the situation where you've just published an article, or just made changes to an article, and want to see the response - frequent checking isn't useful for that either. Google can index an article quickly, but it takes a long time for Google to finally decide where it's going to rank, and checking your stats doesn't help you to work that out. Checking stats frequently when you have an intentionally time sensitive viral article is fun though. However, I use Google real time when that happens! I enjoy checking my stats and manipulating them so that I can see which hubs are having problems. This gives me a chance to do upgrades, etc. Also, checking let's you see if there are missing links unfeatured signs, etc. These things were much easier to do with the old format. I generally don't voice complaints about changes on HP, even when I don't like them, because I know the team is working hard to stay ahead of the curve in keeping the site viable. But I must say there's nothing about the new dashboard design I consider to be an improvement. In fact, to me it's a giant step backward rather than forward. The changes make it harder rather than easier to get things done. As somebody said, this new design seems to have been created by someone who has no understanding of how writers actually use the site. Since changes to the writers' dashboard obviously have no effect on views or on how Google feels about the site, and since writers seem pretty unanimous that the changes aren't helping, I'd vote for a return to the previous design. Then, maybe issue an open call for writers to suggest changes that would actually make things better for them. As long as I can find the info I need, I don't care what the account pages look like, to be honest. It's not a big issue. 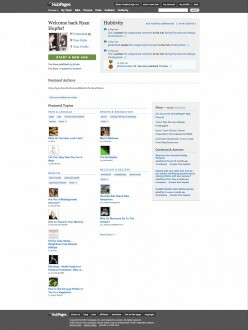 Whoa... What just happened to the My Account page? Looks a bit different. Or is it just me?